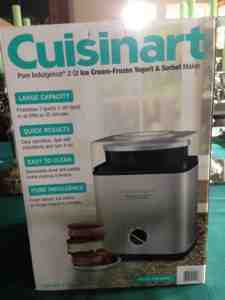 Last year I almost purchased this Cuisinart Ice Cream maker at Costco; and, yesterday, I gave in to temptation. I have a hand-powered ice cream maker which seemed more politically correct, since it conserves energy, but I wasn't using it. Not using an ice cream maker was a good thing, I decided, because ice cream isn't that good for you anyway, I thought. But watching my 93 year old healthy Dad eat ice cream every day, and hearing a diet guru say, "Stop with the low fat thing! Obesity rates have been going up steadily every year since the 'low fat' movement!" made me rethink the health question. 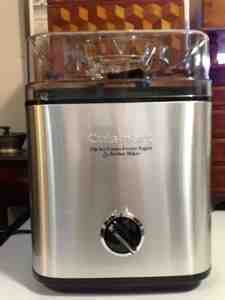 One unexpected benefit is that the Cuisinart makes twice as much ice cream. One disadvantage, the hand powered was much quieter; the Cuisinart has a motor sound for the 25 or 30 minutes that it's churning. In my freezer, which is cold, the churning container was ready in go in six hours. For the first try, I made a half batch of an eggless vanilla ice cream from the included recipe book. We liked it, could not have been easier- cream, milk, sugar, vanilla, freeze. The Costco price was better than any other I could find.